In spite of my encouragement to sleep till at least 8, J woke up early as usual today. So I checked the weather and saw that it was supposed to be in the 70s till after noon. It was a bit cloudy outside so it seemed perfect for a zoo day. When asked what animal she wanted to see first, she told each of us separately that she wanted to see the giraffes. We decided a train ride past them could be a great way to see them today. After that we went to the children’s zoo and enjoyed the splash areas. It was great! We love that having a pass means we can go for just a few hours and do 2 things instead of feeling like we have to see everything in one trip. Are you sure I can’t climb on in? After eating some chicken minis from our favorite fast food place (Chick-fil-A), J went back to the kitchen and stayed pretty quiet. She replied: “just sitting here”. I went in a few minutes later to see a very strange look on her face. 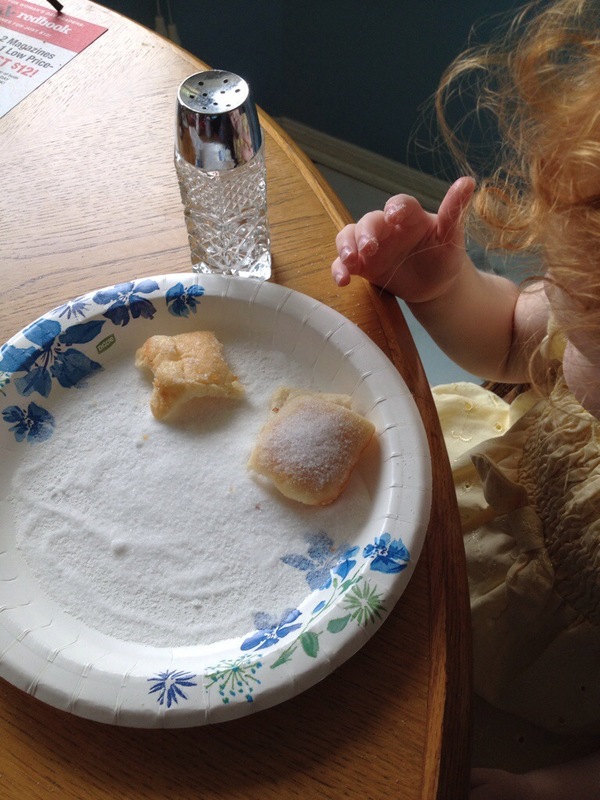 She had just tasted a handful of some of the salt she had dumped on her plate. Yep, most of the previously full shaker was now empty.